Mick Hughes. With Brid Brennan, Stephen Brennan and Penelope Wilton. Monday, July 16 at 8p.m. Tuesday, July 17 at 8p.m. Friday, July 20 at 8p.m. Saturday, July 21 at 8p.m. Mick Hughes. 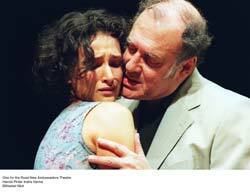 Cast includes Harold Pinter and Indira Varma. Wednesday, July 18 at 8p.m. Thursday, July 19 at 8p.m. Saturday, July 21 at 2p.m. Sunday, July 22 at 3p.m. Kavanagh, Jason O'Mara, and Lia Williams. Wednesday, July 25 at 6p.m. Thursday, July 26 at 6p.m. Friday, July 27 at 6p.m. Saturday, July 28 at 6p.m. Sunday, July 29 at 6p.m. Thursday, July 19 at 8.30p.m. 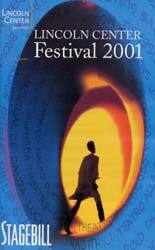 Friday, July 20 at 8.30p.m. Saturday, July 21 at 6.30p.m. Sunday, July 22 at 6.30p.m. costumes by Dany Everett. With Henry Woolf. 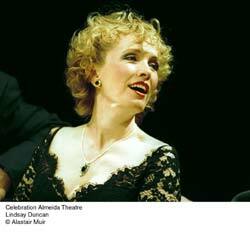 Stephen Pacey, Lia Williams, and Henry Woolf. Tuesday, July 24 at 8p.m. Wednesday, July 25 at 8p.m. Thursday, July 26 at 8p.m. Friday, July 27 at 8p.m. Saturday, July 28 at 8p.m. Thomas Wheatley, Lia Williams, and Susan Woodridge. Sunday, July 29 at 3p.m. Distinguished actors talk about their experiences working with Pinter's plays, screenplays and adaptations. Moderated by Austin Quigley, Dean of Columbia College, Columbia University. Three stage directors of Lincoln Center Festival's Pinter play series discuss their approaches towards Pinter's texts. Moderated by Austin Quigley, Dean of Columbia College, Columbia University.